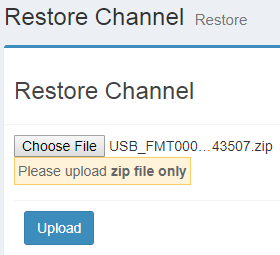 Restore channel function is to restore user’s old CMS channels. After User download file from old Channel. Click "Channel" > "Restore Channel" > Click "Choose File" > Choose File From user local folder > Click Upload. User Channel will Appear in List Channel.